The Pros and Cons of this Sportstech VP300 Vibration Trainer. Results will always vary between users. This powerful Sportstech VP300 Professional Vibration Plate has great potential for those looking to tone up in a fast, effective manner. The main selling point with this home workout system has to be the promise of these powerful engines and the movement this provides. There is 3D spiral technology here, which is said to target “nearly” all muscle groups. This means that it is possible to step on board, start a workout and feel the effects in little time at all. This motion and intensity – which also comes from the 120 different intensity settings – can help many users with their goals for toning and weight loss. In addition to this, there is the potential for improvements in circulation, skin tone and other health issues. Users will also be drawn to this product because of the attention to detail in the design and features for a more productive session. This includes the size of the treads and the training bands. This wider tread does mean that this is a larger product than some vibration plates – with a surface area of 80 by 45 cm. The upside here is that this could improve stability and give users extra piece of mind as they train. Smaller, “user-friendly” options don’t always have so much security. Finally, users can also benefit from the additional features of the remote control, touch display and the music system. The former two features are ideal for setting up the right workout and adjusting settings during the workout. The latter simply makes things more fun with the chance for an inspirational playlist. The company could help newcomers with the learning process a little more, but there isn’t much else wrong with this Sportstech Professional VP300. There are always going to be mixed responses to products like this that promise so much from such a simple system. Some people that work out at the higher levels, on a daily basis will see great changes in weight, tone and skin conditions. Others may put in a lot of work with the training bands and not be as lucky. Then there those that will simply expect too much too soon. That is why it is still important to be realistic and proactive with this product – no matter how smart and powerful it is. Otherwise, users have very little to say in criticism of this vibrating plate. The biggest issue seems to be with the language and lack of information in the manual and poster. The poster wasn’t in English and the manual was a little basic. Some found it easier to just go online and look at YouTube videos instead. What does this mean for a recommendation of this Sportstech Professional Vibration Plate? The issues with the instructions may put off some users that are new to this sort of product. However, those that are willing to put in the time to research and learn workouts will succeed. There is plenty here to help newcomers work on their goals, whether that means weight loss, toning or more. As with all plates, the effort put in determines the results achieved. Still, the design, features and intensity do make things much easier. 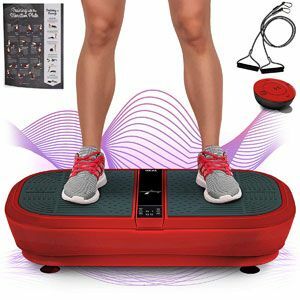 The great tread, powerful motion and much more ensure that this Sportstech vibration plate will help many users. Find more reviews about the Sportstech Professional Vibration Trainer VP300 on Amazon here.